Well, I'm still waiting for a couple things. Remembering to need "this and that" and so on ... Hopefully next week I can start in earnest. - I'll be doing a pre-shade with black paint on the recesses before the main hull color. - A post-shade by spraying more of the main hull color in the center of the panels. Tone it down with a blending if I have too. Then do the same with all the accent colors. or brushed on thinned paint. Dry brushing highlights, wear and doing chipping will be done here too. - Then a coat of Future, to seal in the acrylic and to put on and seal in the decals. - A couple washes using odorless turpenoid dirtied up with a touch of artist's oil paints. - Then another coat of Future to seal that in. - A light coat of some kind of flat so the pigments stick a bit better. I bought some Tamiya weathering pastels, but might grind up some pastel chalk to try too. - Then some final light coats of flat to seal it all in. I might be getting a bit ahead of myself here. But, it does give me some time if you all have any suggestions or ideas. I think this will work though. What I am did ( cause im building the same kit lol ) is sprayed the main hull parts with a black primer, this does a few things, Light blocking, and makes the green that you will put on the hull look a lot better. I have been happy with what I have done so far. - How are you laying the wires and lights in or what is your plan when you get there. I am at a stand still because I haven't got the slightest idea on how to get the wings lit. This is what it looks like currently. The radiator baffles need to be lightened up a bit as I feel they are too dark. I can see where the black might help with the green color a bit (I know that's true for reds). For lighting, I plan on using wire wrapping wire I got from Jerry over at HDAMODELWORX because it's small. tacked down with CA glue and accelerator. place at roughly the right angels. I'll also be using the same LEDs for lighting fiber optics that will run into the wings for the "spotlights" and other external lighting. out some trenches inside the wings is how I plan to do it. For the red "boxlights", I'll be using some red LEDs and a sheet of red styrene that luckily came with my Evergreen odds and ends bag. I'll have to build small light boxes for that. For light blocking, I'm spraying the inside black, then maybe a layer of silver, followed by white to get more diffusion and brighten things up. That plus primer and color on the outside should deal with most light bleed. Really nice work Spencer. Thanks for posting your code also. While I wait for more (of the right) metal tubing to arrive for the disruptors, I refined the circuit schematic. The code is unchanged from before. I'll work on some assembly, light-blocking and greebles soon, but the disruptors have become my priority now that I have what I think is a decent plan. This also arrived in the mail Saturday. It's a socket for using SMT parts on a breadboard. I had a sketchy way of programming the ATtiny85 on the PCB, but these sockets spoiled me when I was a student, so I broke down and bought one. Should be making use of it in the future. Here's where I got it for those interested. Okay, Spencer, now you're just showing off. Oh, wait! That's what we do here anyway! Nevermind. Please continue! One day, I will grow up and be able to draw electrical schematics. But it is not this day! I learned a lot about electronics and schematics a while back, before college, from some books by Forrest Mims. Check some of them out if you have the time. Tubing has arrived. Lots of measurements and numbers to work through this weekend, but I'll survive. Might need to get a good saw and miter box when I'm "in town" next week. wow, that's got to be the most adventurous lighting scheme I've seen. Well done! And with a reference! Thanks Scott. I try to be thorough. Learning as I go on the Klingon BOP. 1.) My razor saw can handle cutting brass and aluminum tubing. 2.) I only have one set of snippers than can actually cut music wire. might wind up using just CA or more likely JB Weld. Will be hitting this hard early next week. I usually use a pencil and paper to work out my details, too! (i.e. measurements, wire and light placements, Resistance notes, wire paths, etc.) It helps me think thought the process without messing up the parts. First crack at rebuilding the disruptors. Just a loose fit for now. Fairly good I would say. A bit drained from it for now, but it should get easier. Yes fairly good Spencer. Are you kidding? These look fantastic! First main cannon built and installed. MUCH more confident now, but sadly, it's all I can do until Tuesday or so. CA glue of various thicknesses and accelerator were used to glue everything together. 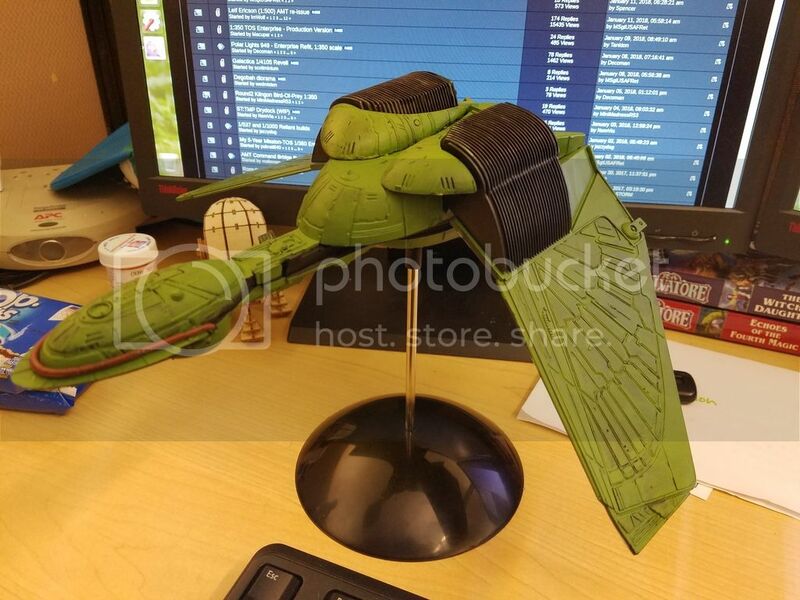 Re: Klingon Bird of Prey - Disruptor Mania! Great work on the disruptors. The lighting is fantastic.